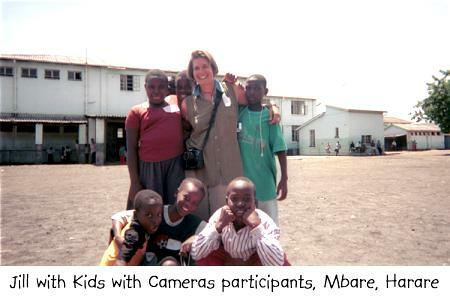 At the end of 1998 my friend Jill Mott left her job as a photographer at the Fort Collins Coloradoan to become a volunteer in Zimbabwe. She was placed as a photographer with an organization producing a feature film in Harare, the capital of Zimbabwe. During this time she also worked with local arts organizations and out of theses contacts the idea for Kids with Cameras was born. 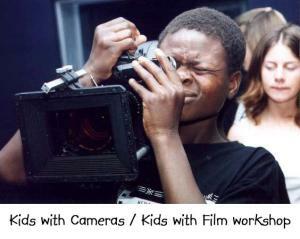 Kids with Cameras is a volunteer run non-profit program that teaches disadvantaged children in Zimbabwe about photography, communications and art. I first heard about the program in January 2000 when I received an e-mail from Jill, part of which said: I have been trying to set up my kids and Cameras project, which I will go into more detail later. The basic idea is that I have 20 disposable cameras that I am going to show kids from 8-12 how to use along with a little workshop and then they will go out and photograph their environment. I hope to have gallery shows and sell the prints to raise money for their school fees. School fees are one of the biggest problems facing children here. School was supposed to be free according to the government after independence but guess what there is no money, where did it go?? Misappropriation of funds. I could probably use some help from a few of you on this project more later! 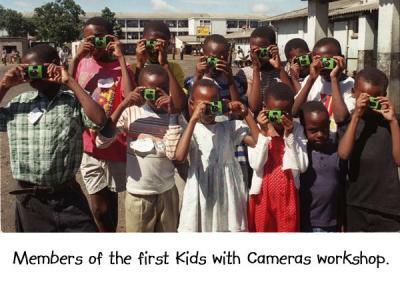 It looks like that will take up every weekend in Feb.
"I am going to spend this weekend teaching 10 kids, from Mbare, (the highest density suburb, the poorest ghetto) of Harare ages 8 to 13 to use disposable cameras I brought over. We will have an all day workshop this Saturday to talk about photography, creativity, communications, and composition interspersed with a lot of games. I have two friends who will assist in the teaching and the Shona, some of the younger kids have limited English and my Shona although it has improved is nowhere at the level it should be. I have managed to get a bit of funding and donations, which wasn't easy considering the state of affairs here. Coca-Cola has donated drinks and a fast food place has donated pies (chicken, beef, Englishy style pies). We have also received free processing and printing for the cameras. We are still searching for a few more bucks. I have had to put a few of the bucks in myself but it is well worth it. We will have a small, small exhibition for the parents and friends of the kids after they see their pictures. More than anything I hope that this gives kids self-confidence and pride in their abilities. They would never have this opportunity in school or elsewhere, many of them have never even seen a camera before. This is a multi-faceted project in that I hope to bring back the pictures and have exhibitions at home and sell the photos to raise money for the participating children's school fees. 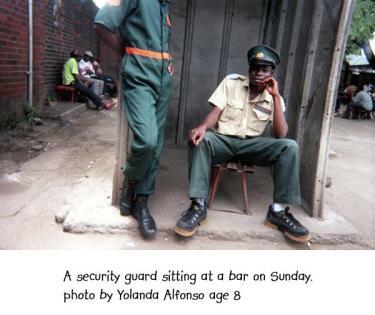 Another thing Mugabe promised the people but didn't follow through on, free education. $50US could pay for a whole year of a child's education, I hope to be able to sell these prints for at least that. Of course that is where you all come in. I need help with finding locations for exhibitions, more donors for more processing and framing etc. I welcome any suggestions not only for donations but anything regarding this project. For those that have ideas I can send you a copy of my proposal. This is a pilot project and I hope to try it again with more specific groups of children i.e. street kids, (very much on the increase, and all sniffing glue) refugee kids, AIDS orphans, etc. etc. and eventually put together a book. Of course all donations are accepted, but more on that later when I am home and don't have to worry about lost or stolen money. About a month later Jill wrote to share the results. a bit worried when only about a third of the kids showed, most of them being male. But it wasn't that tough to fill the spaces of the no shows because some of the kids brought friends and curious on lookers hung out 'til we picked them to join the fun. The kids were great, ranging from 8 to 13. Most were male. It is very difficult to get girls involved in these kinds of activities, because parents are worried about their safety, and they are the main work force in the house and most spend a lot of time doing chores. Something I will need to work on further for future workshops. We had a great time the first day, getting to know each other, playing games and learning about photography. Most kids had never even touched a camera and didn't even know where to look to make the picture. They learned a lot. We not only talked about photography but communications, and art. I think one of the biggest things these kids got out of this is self-confidence and pride. Kids are often not praised in school, and only very conventional subjects are taught, math, history, English. Being an artist or photographer is not encouraged and many people don't even know that is an option for them as a career. When I asked the kids to write an autobiography, and asked them what they wanted to be when they grow up most said soldier, nurse, pilot, or teacher. The second day was the day for handing out cameras and going on their adventure. No one was late, and there were some kids that were there early. We told them to take their time; they had the whole day. Some did, some didn't, some came back within an hour, some at the end of the day. I couldn't wait to see the results and when I picked them up I was amazed, the results were brilliant. Some of my favorite pictures come from the two littlest ones, two 8-year-old girls, who ventured into beer halls, (outside drinking areas, mostly men and prostitutes,) and took pictures of men playing an illegal gambling game. We blew up one picture from each and the kids were shocked. I don't think they themselves expected to make such wonderful pictures. We gave them back their photos, selected a few and had them write cutlines for their photos. Some of you think my cutlines were interesting. Then I conferenced with them, talking about what they could of done better and why certain pictures were better than most. For a few of the kids I had to have a translator but I think they got the gist of it. We had a small exhibition. I keep saying we were going to have an exhibition, and it wasn't 'til we started hanging the photos that I realized they had no idea what an exhibition was. We hung their enlarged photos, and a picture of them next to their picture. Their parents and friends were invited. It was in a midsize, grimy room but we spiced it up with balloons and streamers. I invited some of the volunteers I know and they came which was great, because most of them were very interested and sat with the kids and looked at all their photos and had them tell them about them. I even had the kids give tours of the show. Unfortunately, not many of the parents showed but the ones that did were impressed. I didn't realize how much the kids really enjoyed this project 'til the exhibition when they couldn't wait for someone free to show them their pictures. It was amazing to me. I gave them all certificates of achievement and that made a big difference as well. It is amazing how those little things really make the kids feel. They were all very proud, and I was very proud of them. I thought that would be the end of the project for a while 'til I could get back to the states and find more funding. But... I was wrong. This project has the Midas touch on it. We have been accepted to show the work at the National Gallery here in Harare, during the largest arts festival in the country, which is centered around the gallery. People come from all over the world for this. We are so excited and I can't wait to see the faces of the kids as they see their work on the walls of the gallery in the nation's capital. We have been looking for more funding and everyone we show the proposal to wants to try and help in some way. Unfortunately, not all of it is financial. A Danish NGO wants to try and have an exhibition with it in Denmark, and we have spoken to someone who may help with our book in the future. During the exhibition we will have activities for kids, we will be doing collage with donated material and we will also have a video runninq about the project. I am in the process of editing that, big work. We had one of the kids narrate it, and took him into a sound studio, which was a great experience for him, he thought he was Tupac. So it is all about getting everything ready for the show. The Nat. Gallery is loaning us some of their frames, it is pretty hodge-podge, but it is free and I guess will be kid like in the end. The show opens on the 25th of April with a big bang, due to the bigger part of the exhibition of HIFA (Harare International Festival of the Arts.) The great thing is we get to benefit from all the activities. The bad thing is it is hectic, but I do like being hectic and organizing." In May I received a brief update from Jill about HIFA. "The last week has been hectic trying to get the show for the National Gallery ready, packing, and still trying to find donations, etc. The opening of the Gallery and hence the opening of Kids with Cameras was a great success. Everyone loved the pictures and the concept. Unfortunately, no one bought any pictures. Still crossing my fingers. I really think it is the best exhibit at the gallery right now. We are getting a lot of traffic through because it is during this huge arts festival and the comments people are giving are great. Most can't believe kids shot the pictures. And are really glad to see such positive images with these hard times, "Hopeful!!!" The kids come to see the show tomorrow and I can't wait to see their faces. They will also get to see some of the shows, music, theater, etc. Many of them haven't even been in the city center before, and never even dreamed of the things they will see and do tomorrow. It should be great. Right after HIFA she left Zimbabwe after almost a year and a half and came back home to the States. This is really where I started to get involved. Through e-mail Jill had mentioned to me that she was starting to research sources of funding for the program and being the Internet junkie that I am I started searching and sent along whatever I found. Seeing that I was doing all this on my own Jill started giving me a few assignments for research and by fall, when Jill went back to Africa, I was given the title of U.S. coordinator for Kids with Cameras. I think that at that time there were only two people with titles in the organization (there may still only be two), Jill and myself. One of the big things I could offer was stability, Jill was busy living the life of a volunteer, bouncing around southern Africa. She returned to Zimbabwe for a week, then onto Rwanda where she was commissioned to conduct workshops with the children at the Imbibizi Orphanage in Gisenyi. Then it was back to Zimbabwe for a few months, onto Cape Town, South Africa for three months, then back to Zimbabwe to prepare for HIFA 2001. So the fact that I was in one place helped establish a sort of base of operations. I had all the negatives from the first workshop so I was able to get prints to donors, worked at setting up exhibits, organized public relations materials, etc. HIFA 2001 was a giant leap from the previous year. In May there was a week of advanced training, in preparation of our work at HIFA. This time around Kids with Cameras did not have an exhibition, instead several of the children who participated in the first workshop were accredited as staff photographers of the festival (getting a chance to meet actors, dancers, musicians, and diplomats from many other countries) and they also helped present half-day workshops in pinhole photography and sun prints that were open to the general public. “The first day of the festival after we set up our booth and people started to wander in, the kids were jumping out of their seats to greet them. I can't tell you how proud I was. The kids would lead someone through who we are, what we do and explain the different projects we were working on. They even managed to sell their photos, our T-shirts and some other miscellaneous items we had…The growth and development I saw in the six kids who make up Kids with Cameras over 6 days was enough to give me hope. If I allow myself to think of the rest of the population it is depressing and hopeless but with these kids I know they are the future and can make a difference I have told them so and I hope they will start to believe it. I know it can't be easy when not even your parents support this kind of thinking and the country is literally rotting in front of your eyes. It was a busy summer for Kids with Cameras, following HIFA, we completed a successful training project with a youth group in Dzivarasekwa, a squatter camp west of Harare. During this workshop children documented their surroundings to help promote awareness about water and the environment, through visual imagery. Six members of our original group, from Mbare, who have been participating in Kids with Cameras activities and training for two years assisted in the teaching of this workshop. This was a unique opportunity and exchange for both groups of kids. In August of 2001 we participated in the Zimbabwean International Film Festival, ZIFF. With the help of UNESCO and ZIFF we designed and held a workshop teaching kids about film in which they got hands on experience with Hi8 Video cameras. Kids were introduced to a wide variety of films and used their skills to document all the surrounding events of the festival. Jill was back in the United States in October of 2001 and then our work really began, we started on plans for a large exhibit and sale to be held in December. The exhibit would include prints, from both the initial workshop in February 2000 and the Dzivarasekwa workshop as well as some from HIFA 2001, photo greeting cards made by the children and calendars featuring some of the photos. (The photos in my gallery were all taken from the calendar.) The calendar was one of the biggest tasks, choosing the photos, creating the layout, updating project information and everything else that goes into producing a calendar in just over a month. It was during this time that I received a promotion, Jill named me co-director of Kids with Cameras. She also thought it would be a good idea for us to write up job descriptions, “I do what Jill tells me to” was my reply, only half joking. The space for the show was a temporary one, the show was scheduled to run for four days (Thursday through Sunday) and we had one week before that to get ready. We were lucky to find a vacant storefront in downtown Fort Collins but the place was an absolute mess, exposed wiring, piles of sheetrock and used lumber from interior dividing walls that had been torn down and left all over the place, holes in the walls, torn carpeting, light fixtures that didn’t always work, I could go on and on. But we pulled it off, patched the carpet, painted the walls, covered the wires and it all looked great. In addition to the Kids photos we also had for sale a variety of African artwork that Jill had shipped back. The show was a great success, we sold all of the calendars and through the sale of prints we raised enough money to pay the school fees for 11 children. Things had been a little slow for most of this year but they’re starting to pick up. Jill is working on her Master's Degree in Art Education, I’m doing my best to spread the word about the program and work continues in Zimbabwe. Two workshops were held in August in Mbare. The children were given cameras to go out on their own for a week, shooting agreed stories/subjects. A follow-up workshop was held to get the results. Out of all the photos taken, a selection were made into postcards. 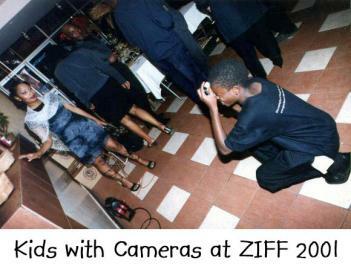 The kids were once again at ZIFF as staff photographers and covered all the functions. The postcards from the workshops were displayed for sale at assorted venues. Based on the photos from the past two years, the new director of Alliance Francaise is planning exhibitions at Alliance offices in Harare and Bulawayo in November and December for two weeks each. If these exhibitions are successful there is a possibility of Alliance taking the photos on a tour of Alliance centers in Africa and possibly elsewhere. If that happens, they will donate funds to Kids with Camera covering school fees for next year and to help hold more workshops. We are facing many challenges in building Kids with Cameras, the biggest of which may be the political situation in Zimbabwe. In the past few years the government of Robert Mugabe has clamped down on a growing opposition movement, allowed squatters and so-called war veterans to occupy white owned commercial farms, placing restrictions on the media and effectively stealing a presidential election earlier this year, all of this as half the population of the country faces impending starvation. I had planned on visiting Zimbabwe this December but with everything going on in the country it doesn’t seem to be the best time.